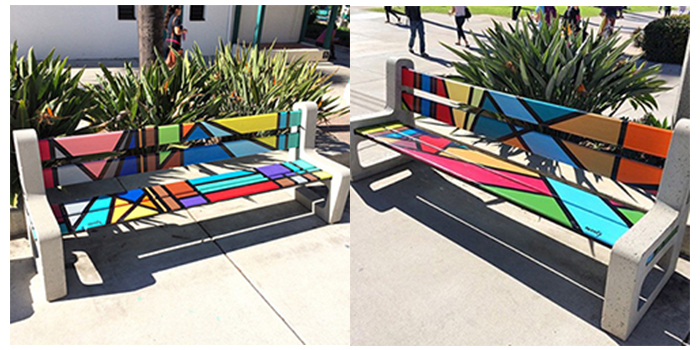 The benches are currently featured on the campus of San Diego State University. They were created in 2014. It was a blast working with the Design 1, Art 101 students of San Diego State University as a visiting guest artist through the “ARTS ALIVE” program at SDSU. On November 3, 2014 from 10am to 2pm we worked together on various benches on the Faculty/Staff Patio. I started the process and then the students took over the project and completed eight other benches over time throughout the campus. Thanks to David Fobes, Dani Bedau, Stephanie Burns, and the SDSU creatives for having me as a visiting artist at San Diego State University.